The Mac and iOS versions of Ulysses got handy, incremental improvements on Wednesday, and AppleInsider puts virtual pen to paper to test them out. Ulysses 2.7 is a writing studio, or a writing environment, rather than a straight word processor. Users write in it like they would Pages or Microsoft Word, but Ulysses is focused equally on writing, organizing all writing work, and then preparing it to be read online or in print. This is software that has earned a following —the new 2.7 updates for iOS and especially for macOS are aimed at pleasing those existing fans. Rather than substantial changes that might draw new users, the updates are about steadily improving what Ulysses already offers. The most visible development is that Ulysses 2.7 for macOS Sierra now supports the Touch Bar on the new MacBook Pro. Without taking your fingers off the keyboard users can get the Ulysses version of a table of contents in a document —or what this app refers to as a "sheet." Sheets are a content list compiled from Markdown-style headings, so if you use Markdown, you're happy. If you don't, the button and its equivalent on the app's main window do nothing at all. Markdown is a markup language with plain text formatting syntax, designed so that it can be converted to HTML and many other formats easily with an assortment of utilities. The syntax is often used to format readme files, for writing messages in online discussion forums, and to create rich text using a plain text editor. If you've used the Slack correspondence tool, you've probably used Markdown. Ulysses is first and foremost a Markdown editor: it expects you to know and use this format for quickly writing text that will go on web pages. So, the typical HTML codes that are behind every web page are achieved here with just a few keystrokes. If Ulysses has fans then Markdown has evangelists, and they will be pleased with this contents button and more. This expectation that Markdown will get used extends to the installation of the app: on first running it, you're asked which of various Markdown versions you prefer. There is a note saying that if you don't know what any of this means, just ignore it. There is some peril to ignoring it, though. Writing in Ulysses without using any Markdown takes some strenuous effort in the Preferences. With the makers acknowledging on screen that Markdown is geeky, it would be good if they also provided a simple Off button for the feature. As it is, if you are not a Markdown fan then the most useful of the Touch Bar buttons is one that hides everything but your current sheet. That's not the same as full screen, which is also available, but it shunts the Ulysses library of all the other sheets out of the way. The feature is particularly welcome when working with research documents: it's a well-done aid to focusing. Ulysses 2.7 for macOS Sierra's other visible change is the addition of Safari-style tabs and what they do is good, they just don't yet go quite far enough. If you're not familiar with the feature in Safari, pressing Command-T when you're on a website will open a new tab and take you to it. In Ulysses, pressing Command-T does much the same: it opens a new tab right alongside your current document and takes you to that new page. Unlike Safari, that new tab is really a view on the same sheet you were reading. You can change that to any other sheet or start a new one, however, and know that the sheet you were reading is still open right where it was. It's one click away. It would be nice if it were one keystroke away, though: Safari lets you skip through all your tabs with Command-Shift-Right or Left arrow. When you have two or more tabs open, Ulysses does let you drag out one at a time into new, separate windows. You can't drag them back the way you can in Safari, however: you have to choose the Merge All Windows menu command. Similarly, when you have multiple windows open, Safari and most Mac apps will let you move between them by pressing Command-` but Ulysses does not. This is all on the macOS update: the simultaneously released Ulysses 2.7 for iOS is chiefly a bug fix release. So far this doesn't sound like a rave: the Touch Bar and Tabs are fine and the iPhone/iPad app isn't significantly changed. Plus, the update could be smoother on macOS, as there's no Check for Update button. You can read About Ulysses to see what version you're on, but then you have to go to your Mac's Software Update menu to get any new edition. However, the macOS additions are big changes given that this is just a small point update from 2.6 to 2.7. Arguably Ulysses didn't need much. The 2.7 version is an update to a very good app —it's just particularly good that both the macOS and iOS versions are being updated in step. That is not happening with Ulysses's chief rival, Scrivener. After many years of Scrivener being on Mac (and PC) but not iOS, an iOS version came out earlier this year, which is a remarkably good version 1.0 release which hasn't seen or needed even a .1 change in its several months of release. 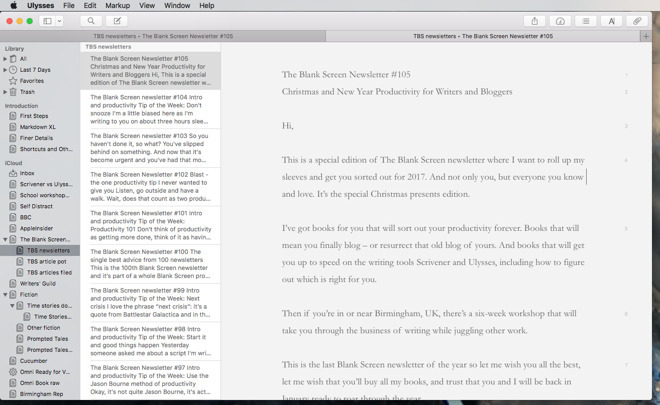 But, now Scrivener fans are waiting for the new macOS update which was expected over the summer. 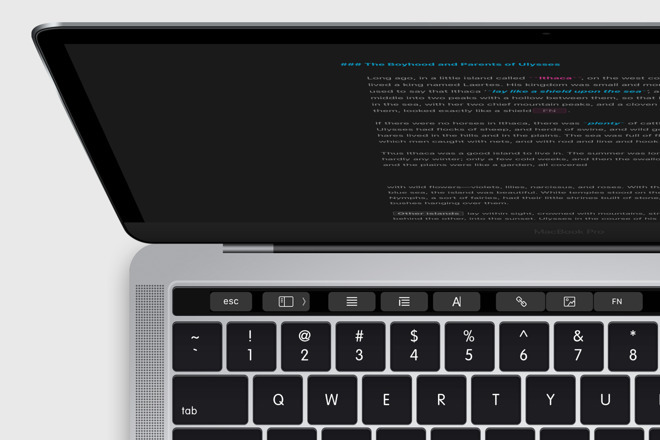 Both applications give you greater control over your writing than something like Word or Pages, and now both have very good editions for iOS and macOS. The differences between them are even the subject of whole books. In short, though, if you haven't tried either Ulysses or Scrivener and you write a lot, then you're likely to find either of them useful. 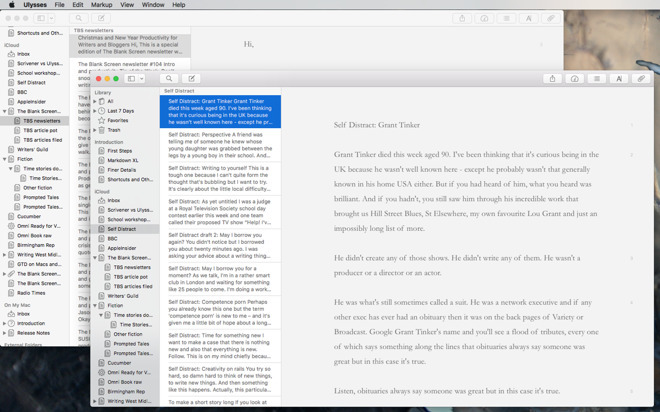 Ulysses feels better for lots of short writing; Scrivener for longer-form books. However, examining Scrivener in depth is an exercise for another day. Ulysses 2.7 for Mac requires OS X 10.10.0 or higher and costs $44.99 on the Mac App Store. Ulysses 2.7 for iPhone and iPad requires iOS 9.0 or higher and costs $24.99 on the App Store.